What would you do if you took your two small children round to your mother’s and she wasn’t there, her bed unmade and her car parked in front of the house? Would you assume the worst and call the police? Stella doesn’t, she knows her mother too well, and later in the week when Sheila still has not appeared it is not Stella but Sheila’s sister Joyce who raises the alarm. Stella’s sister Marie dashes home from the USA and her on-off marriage, full of reproaches. It’s a recipe for an all-out family drama. But that’s not what this quiet, engaging novel is about. There are other characters in town and in play: Tacita, author of a blog called ‘Washed-Up – One Woman Swearing at her Kitchen Sink’, a howl about her imperfect marriage; Theresa, apparently wedded to her life as a single woman and museum curator; Zeki, Stella’s husband, in danger of being drawn into white-collar crime; and Jonathan, Tacita’s wayward husband. Together their stories weave around Stella’s to create a web of aspirations, misunderstandings and insights. And there is one more important character, the historic Essex market town of Saffron Waldon where it all starts, much more than mere location. Stella and her town are symbiotic: she embodies its apparent serenity and quiet depths while the place gives her a sense of belonging, a certainty about who she is in today’s world. And what of Sheila? What prompted her disappearance, and is it her on the slab in Harlow? Stella has to go to identify the body, or not, but she doesn’t have a driving licence. Thus begins a road trip with the unlikely trio of Stella, Theresa and Jonathan setting out on a journey of discovery and self-discovery that takes them ultimately to another Essex location, Southend-on-Sea, where all is revealed, up to a point. Finally the tale comes full circle, back to Saffron Waldon, set amongst its fields and crops under a cloudy sky. Stella, Theresa and Jonathan are coming home. Part of the Spell casts its own enchantment on the reader, teasing you in through meanderings and byways to the crux of the matter – honest self-knowledge, engagement with the reality of our ordinary lives, facing up to ourselves with all our history, our limitations and faults, forgiveness of ourselves for not being bigger, better people. This is the antidote to the ‘airport’ novel with all its flashy exaggerations and sensationalism. It shares some themes with Rachel Heath’s well-received first novel, The Finest Type of English Womanhood, but that was set at a historically significant moment, in South Africa just before the advent of apartheid, with the Nationalist victory of 1948, and its heroines were fish out of water. Stella is ordinary and rooted, and her patch is very English. 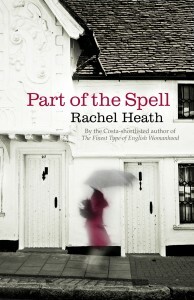 Part of the Spell is a perceptive and warmhearted celebration of home, and of knowing and accepting who you are.